Mr Russell wonders why are the Scottish Conservatives supporting the UK government in its Brexit efforts. The Brexit secretary says a no deal is unacceptable, as is the prime minister's deal. He insists the time has come to say to the people of this country: "What do you want? Do you really want to continue with this farce and nonsense?" If this debate does nothing else, it will send a message that the Scottish Conservatives are not representing Scotland Mr Russell concludes. Brexit Secretary Mike Russell says we now know the Scottish Conservatives will be fighting the next Scottish Parliament election with the slogan "obey Mrs May", perhaps with a picture of a dalek. Mr Russell says Welsh First Minister Mark Drakeford sent him a message saying today is another remarkable day in politics, as it is the first time the same motion was being simultaneously debated in the Welsh Assembly. The cabinet secretary insists that in Wales, Scotland and Northern Ireland there is a very acute sense of the impending disaster that is Brexit. What will happen with Brexit is the rich will take the profit and the poor will take the blame says Mr Russell. Threats to medicines and food supplies are unprecedented in peace time he adds. "The UK government is an international laughing stock." The Tories are not trying to protect democracy rather they are trying to protect their party, he adds. Mr Tomkins says the SNP has boxed itself in by its own red lines it set two years ago and have had their fingers in their ears ever since. You cannot take back control of your borders if you stay in the single market, he says. And you cannot take advantage of Brexit with an independent trade policy if you stay in the customs union, he adds. Deputy First Minister John Swinney highlights Ruth Davidson backed remaining in the single market immediately after the result. Mr Tomkins insists the party's view is to "obey the verdict of the British people". Referendum results must be respect and it is our duty to deliver what is voted for, he argues. Tory MSP Adam Tomkins insists the withdrawal agreement delivers what businesses want, it delivers on the UK's priorities, the EU's priorities and even delivers on what the SNP said they wanted. Mr Tomkins lists the areas it delivers on to a chorus noes by the opposition, but persist and warns of the danger of not backing it. The SNP demands are met by the agreement, he reiterates. If the deal is the triumph Jackson Carlaw talked about why is it that the majority of Conservatives don't support the deal either, intervenes the first minister. I support this deal, hits back Mr Tomkins and calls on the deal to be backed. Mr Findlay urges the Scottish Tories to change tact and call for no deal to be ruled out. He says the internal politics of the Conservatives have dominated UK politics for too long. Whether people voted leave or remain, they did not vote for their communities to be impoverished the Labour MSP states. Mr Findlay urges the prime minister to take no deal off the table, extend Article 50 and drop her deal too. A £1.6bn government fund has been launched to boost less well-off towns in England after Brexit. The pot is split into £1bn, divided in England using a needs-based formula, and £600m communities can bid for. More than half of the money, to be spread over seven years, will go to the north of England and the Midlands. Labour called it a bribe to influence MPs to back the PM's Brexit deal and critics say it does not cover cuts to local authority funding. The Department of Housing, Communities and Local Government said there will be additional announcements "in due course" for Wales, Scotland and Northern Ireland. Labour MSP Neil Findlay says there are 24 days to go and the country is sill in limbo, with companies, workers and EU citizens in the dark and unsure of their rights. Mr Findlay says there is serious threat to the livelihoods across Scotland and it won't be Jackson Carlaw or the privileged few who suffer. It will be the same people that always suffer, them who toil the most, he says. Mr Findlay asks, in response to Mr Greene accusing Labour of opportunism when calling for a general election, if it was opportunism when Theresa May called for a general election and it blew up in her face. Green MSP Ross Greer says fundamentally what is happening today is a "damage limiting exercise", a "defensive action". The scale of chaos and incompetence at Westminster has gone on for so long that there is a danger of it people normalised, he warns. Mr Greer says the public must be told about what Brexit means for medicine and food supplies, adding the UK cabinet has been warned about it. I appreciate the Scottish government did not cause this crisis but they must make sure the public are adequately prepared, he says. For most people a drop in GDP is an abstract figure, but for people on the ground it means loss jobs and lower salaries the Green MSP explains. He says communities devastated by austerity tended to vote for leave and this had been recognised in the recent funding announced for them - but this will not cover the loss from Brexit he adds. Mr Greer highlights that the leave campaign broke the law, meaning if the referendum had been binding the result would have been struck down. Efforts to encourage EU citizens to stay in Scotland after Brexit are to be stepped up, Nicola Sturgeon has told members of the French parliament. The Scottish first minister addressed a committee of the Assemblée Nationale during a visit to Paris. She said she would "always make it clear that EU citizens are welcome". The Home Office is currently testing an application system for settled status in the UK, which it said 100,000 people had successfully taken part in so far. In January, Prime Minister Theresa May announced that fees for EU nationals to apply to stay in the UK after Brexit had been scrapped - although Ms Sturgeon said this was only after lobbying from other parties. What is the EU settlement scheme? How do you apply for settled status after Brexit? Lib Dem MSP Alex-Cole Hamilton says: "These are days of national humiliation. "It is an irony that a once great country should be laid so low by a jingoistic elite. "They have brought us to the cliff edge of no-deal." Lib Dem MSP Alex-Cole Hamilton insists a Brexit without a deal may not be survivable for all the people we represent. He highlights the sense of panic for those who rely on medicines which have a short-life. Mr Cole-Hamilton also points to farmers who are on suicide watch fearing a no deal Brexit and its impact on exports like lamb. SNP MSP Stewart Stevenson warns we will not get the "sea of opportunity" we have been promised. We will not get control of our fishing waters, he adds. SNP MSP Bob Doris warns of 100,000 patients being put at risk by Brexit. Mr Doris also warns about access to drugs for rare conditions post-Brexit. No deal must be taken of the table, not for the political classes but for the constituents and patients' cases he has outlined this afternoon, he says. Mr Doris concludes arguing this is a "matter of life and death" and adds "let's bin Brexit". Scottish and Welsh politicians are joining forces in a bid to force the prime minister to change her position on Brexit. An identical motion is being debated simultaneously by the Scottish Parliament and the Welsh Assembly - with co-ordinated votes. It will underline opposition to Theresa May's deal, demand a delay to Brexit and call for "no deal" to be ruled out. The UK government said the deal was a good one for Scotland and Wales. Reality Check: Can Parliament stop a no-deal Brexit? 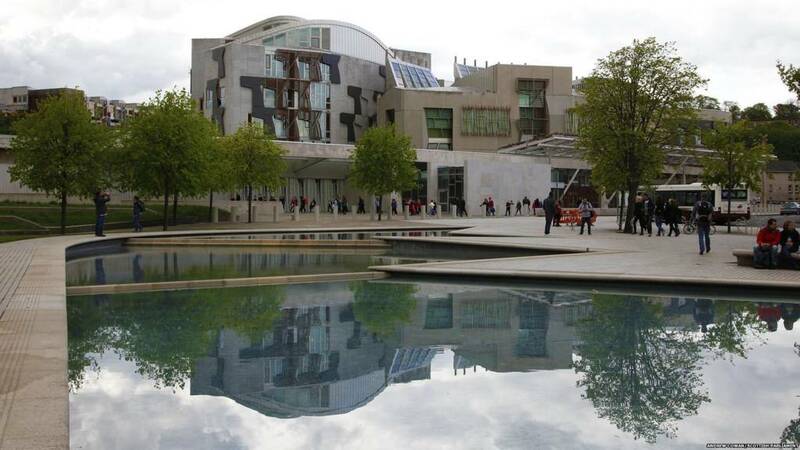 Labour MSP Alex Rowley says while there are issues around extending Article 50 beyond the European election, "where there's a will, there's a way". Labour is ready to talk to the UK government and others on the way forward he says, but not while cash is being wasted on "no deal brinkmanship". If you want to watch the debate at the Welsh Assembly join our colleague in Cardiff here. The Welsh Government motion, co-submitted by Plaid Cymru, says leaving the EU without a deal would be "completely unacceptable". It says Britain's withdrawal from the EU should be paused "so that agreement can be reached on the best way forward". SNP MSP James Dornan insists: "I echo the voices of the Scottish people who voted to remain. "They've made it absolutely clear that a no deal Brexit would be catastrophic for Scotland culturally, socially and economically." We're potentially only 24 days away from a catastrophic no deal scenario, he says. Tory MSP Jamie Greene says the prime minister's deal was rejected by many long before it was read or even published. He asks if the deal was a bad one, why do the EU27 think it is good. There is not an appetite in Brussels to rip up the deal and start again, Mr Greene adds.